PA-18 swung sharply against the president’s party. How does it compare to past House specials? — Based on the two-party vote, Trump won PA-18 by 20.3 points in 2016 while losing the national popular vote by 2.2 percentage points, meaning the district’s lean was 22.5 points to the right of the nation as a whole. Conor Lamb’s (D) apparent victory margin of 0.3 points in Tuesday’s special election equaled a swing of 22.8 points toward Democrats relative to the district’s 2016 lean. — The average swing for the GOP in U.S. House specials during President Donald Trump’s tenure is -13.7 points and the median swing is -18.4 points. These marks are worse than every modern president save Gerald Ford. — Lamb’s win on Tuesday was the 10th-largest swing against the presidential party in special elections in the past quarter century. Relative to the 2016 presidential election result there, the PA-18 special had a large swing in the Democratic direction. Looking at the two-party vote, Trump won the district by 20.3 points in 2016 while losing the national popular vote by 2.2 percentage points to Hillary Clinton, meaning the district’s lean was 22.5 points to the right of the nation as a whole. Conor Lamb’s (D) apparent victory margin of 0.3 points over state Rep. Rick Saccone (R) signified a 22.8-point swing in margin toward Democrats from the 2016 presidential result in PA-18. From a historical perspective, this was a sizable though not record-breaking swing when comparing U.S. House special election results to previous presidential numbers. In 175 select Democrat-versus-Republican contests going back to 1953, Lamb’s win ranked as the 25th-largest swing against the president’s party in that time period. Using these data, we can also see how different presidents fared in special elections by looking at the average and median swing in the specials that took place during their tenures. Notes: The data use the two-party vote for president and for U.S. House special elections. The data exclude the following special elections from 1953 to 2018: elections that took place concurrently with a regular election for the same seat in a November federal election, elections where one party had more than one candidate running, elections where an independent or third-party candidate finished first or second, elections where an independent or third-party candidate won 20% or more, and elections where one major-party candidate won less than 10%. Some specials were not included due to a lack of presidential election data for congressional districts. Sources: Greg Giroux, CQ Press Guide to U.S. Elections (6th ed. ), OurCampaigns, and state election websites for special election data; Gary Jacobson for two-party presidential vote by congressional district. As Table 1 shows, presidential parties have experienced varying degrees of success or failure in special elections since Eisenhower. Of course, relatively few House special elections take place during a president’s time in office, but considering President Trump’s position in these data, we thought the data were worth mentioning. Despite Eisenhower’s relative popularity, Republicans suffered large swings against their party in specials during Ike’s tenure. Perhaps in line with the shifts in the specials from 1953 to 1960, Democrats won huge gains in the 1958 midterm election. The presidential party experienced negative average swings during the years of Richard Nixon, Gerald Ford, Jimmy Carter but had positive average swings during the tenures of John F. Kennedy, Lyndon Johnson, Ronald Reagan, and George H.W. Bush. Since Bill Clinton’s time in office, however, the president’s party has consistently suffered negative swings relative to the most recent presidential election. In fact, the median swings for Clinton, George W. Bush, and Barack Obama were almost identical. Although there have only been six Democrat-versus-Republican special elections during Trump’s presidency (thus excluding the all-Democratic special in CA-34 last year), four of those contests featured pronounced swings against the president’s party. As a result, the average swing for the GOP in specials during Trump’s tenure is -13.7 points and the median swing is -18.4 points. These marks are worse than those of every president save Ford, though like Trump he also had a very small sample size of special elections. But the U.S. House data fit in with all special election data since Trump’s election in November 2016: in 90 Democrat-versus-Republican special elections for Congress or state legislatures, the average swing has been 16.0 points in favor of Democrats (or -16.0 for Republicans) relative to the 2016 presidential election result. 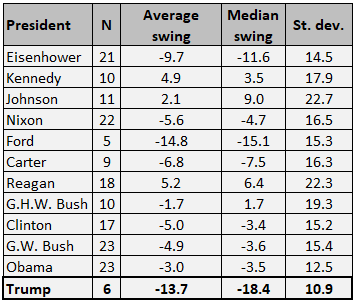 Note that the standard deviation for swing in specials during the Obama and Trump years is smaller than for other presidents, which indicates that the range of swing outcomes varied less than in previous years. This pattern might reflect the increased polarization of the electorate, in that the overall electoral environment may influence special election results more consistently across the country, perhaps as a result of the increased salience of partisanship and the decreased importance of more parochial factors. If we slice our data set to include just contests since 1993 — analysts often cite Clinton’s election in 1992 and the Republican Revolution of 1994 as the start of a new, more polarized era — Lamb’s win on Tuesday checks in as the 10th-largest swing against the presidential party in special elections in the past quarter century. 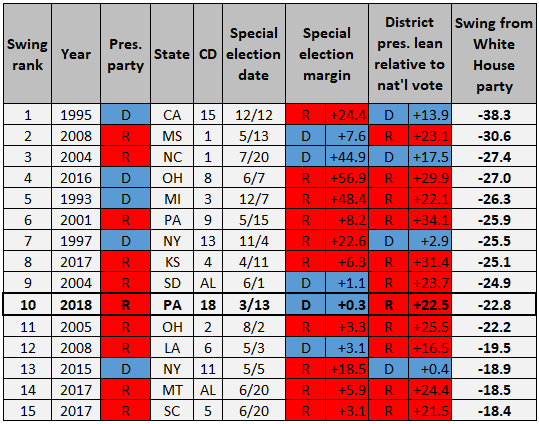 Table 2 lays out data for the 15 most negative swings for the president’s party from 1993 to 2018. The largest swing against the president’s party in this period was the big Republican win in CA-15 in 1995, when Tom Campbell (R) defeated Jerry Estruth (D) in a contest to replace ex-Rep. Norman Mineta (D), who had resigned. Campbell’s 24-point win differed markedly from the 14-point edge Clinton had in the 1992 presidential election (two-party vote). Other notable contests on this list include three additional Trump-era specials: KS-4, MT-AL, and SC-5. The shift in PA-18 actually ranks as the second-worst swing for the president’s party during Trump’s tenure, behind the KS-4 special in April 2017. As things stand, two other congressional districts will have special elections before the 2018 midterm election: AZ-8 on April 24 and OH-12 on Aug. 7. Based on the 2016 election, the presidential lean of the two districts favors Republicans — R +24.5 in AZ-8 and R +14.1 in OH-12. However, if the swings in those contests follow the average swing during the Trump era (D +13.7), they will be competitive races. This is particularly true of OH-12, which would see its Republican lean essentially neutralized by the average swing in congressional contests. The PA-18 result should scare Republicans, but if the GOP loses OH-12 just three months before the midterm election, those fears will grow exponentially. 1. The data exclude the following special elections from 1953 to 2018: elections that took place concurrently with a regular election for the same seat in a November federal election, elections where one party had more than one candidate running, elections where an independent or third-party candidate finished first or second, elections where an independent or third-party candidate won 20% or more, and elections where one major-party candidate won less than 10%. Some specials were not included due to a lack of presidential election data for congressional districts. 2. MI-13 will have a special election concurrently with its regular general election in November to fill the remainder of ex-Rep. John Conyer’s (D) term in the current congress, but concurrent specials are not included in the data used in this article.